Cervical cancer starts in the cells of the cervix. 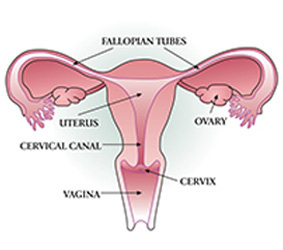 The cervix is part of the female reproductive system. It is the lower, narrow end of the uterus. Squamous cell carcinoma of the cervix, which starts in the cells that line the outside of the cervix. This is the most common type of cervical cancer. Adenocarcinoma of the cervix, which starts in the glandular cells that line the inside of the cervix. These cells make mucus and other fluids. To learn more about cervical cancer, visit the Canadian Cancer Society. You will also find links to other organizations that provide information related to cervical cancer. The main cause of cervical cancer is the human papillomavirus (HPV), a common sexually transmitted virus. Learn more about HPV on the human papillomavirus page. The more sexual partners you have, the greater your risk of being infected with HPV. Your risk may also be increased if a partner is a carrier of HPV or has had multiple sexual partners in the past. Most HPV infections occur in the first few years of sexual activity. There is some evidence that regular use of condoms or a diaphragm can help reduce the risk of cervical cancer by reducing exposure to HPV. The evidence is stronger for condoms than diaphragms. It’s important to know that even condoms can’t protect 100% against HPV or eliminate the risk of cervical cancer. The HPV vaccine (Gardasil®) is available at no charge to all Grade 7 girls and boys through Ontario’s publicly funded school-based program. In addition, the HPV vaccine is available on a user-pay basis. It is approved for women up to 45 years of age. If you are a woman, we encourage you to speak to your doctor about getting immunized. It is ideal to have the vaccination before you become sexually active and may be exposed to the HPV virus. However, even if you are already sexually active you may also benefit from the vaccine. The vaccine prevents most but not all cervical cancers. So all women – including those who have received the HPV vaccine – need to be screened regularly for cervical cancer. If a woman who is infected with a high-risk strain of HPV smokes, her risk of cervical cancer increases by up to 80%. Smoking inhibits the immune system, making it harder for the body to fight off infection. As well, smoking is linked to many types of cancer and other diseases. There is no safe kind of tobacco product and no safe amount of smoking. For more information about quitting smoking, you can visit the Canadian Cancer Society. Pap tests check for cervical cell changes caused by HPV infection. Cervical cancer can sometimes be prevented by following these cell changes closely and treating them if necessary. Regular screening with Pap tests means there is a better chance of finding pre-cancerous cell changes so they can be treated and likely cured before cancer has a chance to develop. Be sure to go for regular Pap tests, and for follow-up testing if your Pap test result is abnormal. See the Screening section below to find out more, including who should get screened for cervical cancer. Screening with regular Pap tests can find cancer early when it is small and less likely to spread. At this stage, there are more treatment options and a better chance the treatment will be successful. Screening is the only way to find the early changes that might lead to cervical cancer. Women 21 and older who are or ever have been sexually active, should be screened regularly for cervical cancer. Based on the latest clinical evidence, most women should be screened every 3 years. Regular screening can stop at the age of 70 if a woman has had 3 or more normal tests in the previous 10 years. Most early stage cervical cancers are diagnosed in women who have been screened. Most late stage cervical cancers, which often lead to worse results, are diagnosed in women who have never been screened or have not been screened regularly. There is a test that checks for HPV infection, the main cause of cervical cancer. However, the HPV test is currently not publicly funded. Until it is funded, we recommend that the Pap test continue to be used for cervical screening. For more details about when and where to get screened, and to learn about the Pap test, the Ontario Cervical Screening Program and more, go to the Screening for Cervical Cancer page. For more information about diagnostic tests for cervical cancer, visit the Canadian Cancer Society. To learn more about types of cervical cancer treatment, visit the Canadian Cancer Society. In 2013, 523 cases of cervical cancer were diagnosed in Ontario, making it the 15th most common cancer among women. In 2013, there were 144 deaths from cervical cancer. The rate of new cervical cancers went down significantly between 1983 and 2005, and has been stable ever since. Compared to other cancers, cervical cancer is more common in younger women, with the highest rate occurring in women ages 40 to 44. Between 2012 and 2014, screening participation was highest in women ages 30 to 39 and lowest in women ages 60 to 69. Learn about your risk of getting cervical cancer – Visit My CancerIQ and get a personalized risk assessment and action plan. Learn about Ontario’s HPV immunization program – Visit the Ministry of Health and Long-Term Care for vaccination information.